More than six months before the best performance of his career, Dekoda Watson was heavier than he had ever been. He was just being a devoted husband. At the time, Watson’s wife, Cristina, was pregnant with their daughter. Watson joked he ate double whatever Cristina ate. The weight gain had a snowball effect on his job. Watson, who says his maximum playing weight should be 255 pounds, ballooned to 272 when the 49ers offseason training program began April 16. 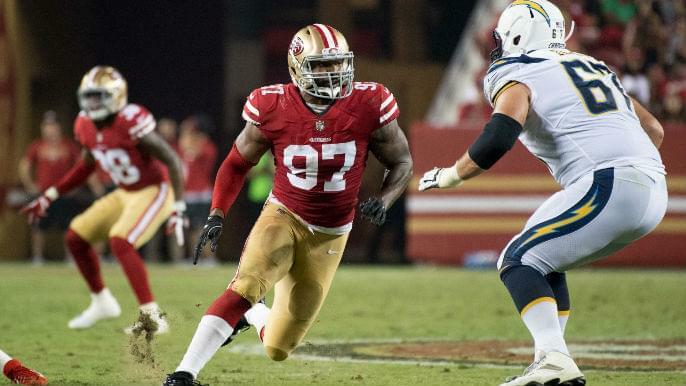 Two days before San Francisco’s season opener at Minnesota, the veteran defensive end suffered a Grade 3 hamstring tear in practice. He was in coverage when he felt something in the back of his leg. The 49ers placed him on injured reserve. So Watson went vegan for the first time in his life. He felt fresher. When the 49ers practiced, Watson trained on the side with strength and conditioning coach Ray Wright. Watson slimmed out to 246 pounds. The 49ers activated him last Thursday prior to their Week-9 matchup with the Oakland Raiders. He returned a faster player. Watson recorded 1.5 sacks and three total tackles in the 49ers’ 34-3 win, which snapped their six-game losing streak. The 30-year-old propelled a struggling defensive line to undoubtedly its best performance of the season with eight total sacks. Watson used his go-to “bull rush” move to hit the quarterback and condense the pocket for his opponents to do the same. When he was sidelined, Watson said he tried bringing energy on the sidelines, hyping his teammates through celebration and encouragement. When he returned to the field, that energy manifested physically. For the first time all year, the 49ers defensive line dominated, which trickled down to the rest of the defense. Watson, the fourth-longest tenured NFL player on the 49ers roster, has bounced around five teams in the past four years. Last March, he signed a three-year deal with the 49ers. He was a rotational piece on a defensive line that mustered just 30 sacks in 2017. He did not have one. Watson looked and felt nimbler in his return last Thursday. Watson temporarily scrapped his diet this past weekend when he visited Texas. “It’s Texas,” he says. But he plans to stay vegan. He is actually starting to enjoy it. After his Week-9 performance, and his long wait for it, he sees no need to revert to old habits. “It was just being lazy and not doing what I needed to do,” Watson said.